#Blogoween | Trick of Treat! Prompt: Wednesday 3rd: Trick of Treat! Woo, you get to go Trick or Treating! Choose who and/or where you would love to go trick or treating. While I find this prompt to be really fun and festive, I don’t know why I had such a hard time thinking of who and where I would go trick of treating with. I would have to say the where was the really difficult part for a few reasons, but I will go more into that later. 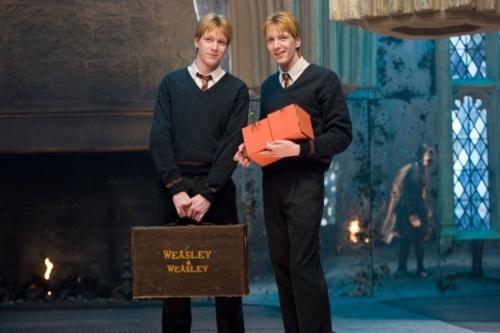 If I could go trick or treating with anyone I think I would have to go with Fred and George Weasley. They are fun, and lets be honest, their tricks would be amazing! I think it would be fun following them around and seeing the fun they would have hiding behind some really awesome costumes and a few original tricks to try out on muggles. Now, you may have noticed I said trying these tricks out on muggles, that is because I don’t think there is any trick or treating going on in the wizarding world, but maybe I am wrong? But, if there does happen to be trick or treating in the wizarding world I would have to pick Godrics Hallow. The reason I ended up picking this location was for a few reasons. The significance of the location to the books is founded. Not only did Harry Potter first meet Voldmort here, but also those scenes of Harry at the graveyard was so emotional. But, apart from it being a significant place I also think it would be a great place to get into the spirit. There are a bunch of homes owned by witches and wizards, there is a large cemetery, and if the movies are anything to go off of, it is a beautiful town. Who would you go trick or treating with? this would be amazing! the twins would be so much fun!